Below is the list of words, complete with links to their definitions on the American Heritage site. As always, this list is subjectively selected by the folks at American Heritage. 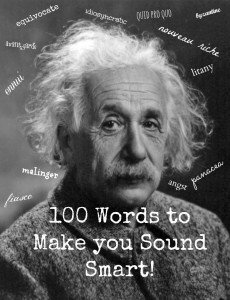 You may or may not agree that these particular words are the 100 most likely to make you sound smart, but you’ve got to admit that most of them will sound impressive in a job interview or on an SAT essay–that is, if you use them correctly. Check the list below. If you are not sure of a word’s meaning, click it and review the definition. I will soon be posting a quiz to test your knowledge. You can also save the poster image below the list — feel free to pin it to a Pinterest board or post it on social media. Even if you don’t care about projecting an intelligent persona, this is a great way to expand and enrich your vocabulary. Enjoy! Feel free to leave your comments below! Bonus points if you can finagle words from the list into your comment! I was hoping for more difficult words. I have a fairly solid vocabulary, but I know 100% of these words. The “insidious” link has been repaired. Thanks. The link to insidious doesn’t work, or rather doesn’t yield a definition. Insidious is one of those words that I “think I know,” but if you press me, I couldn’t give a definition for it. Kitsch, on the other hand, I know that word very well, but initially it was hard for me to define. I think the AH Dictionary completely misses the definition. It doesn’t mean popular. And “garish or overly sentimental” has nothing to do with it. “Uncultivated” is on the right track, but also wrong. It’s about perspective. One man’s kitsch is another man’s treasure. If I say an item is kitsch, it means those who like it are cultivated in exactly the wrong culture. Their culture is narrow, poor and ill-informed. Yet it may also be charming, a fine example of this narrow, poor culture which I nevertheless admire.